Semigloss and high-gloss paint differ from one another in more ways than the amount of light they reflect. In terms of performance, appearance and ease of use, there is a great deal more difference between high-gloss and semigloss paint than between semigloss and satin. Most of these differences stem from the fact that high-gloss paint is an enamel, a very smooth and durable paint that acts in ways that can surprise painters experienced in using paints with lower sheens. Choosing the right gloss can greatly enhance the appeal of a painting project. The most obvious difference between semigloss and high-gloss paint is the amount of light they reflect. Glossier paint makes colors look brighter or bolder. It accentuates curves and detail work, and can make trim and doors stand out from their surroundings more effectively. However, it also makes imperfections or rough areas more visible by exaggerating the patterns of light and shadow they create. High-gloss paint is enamel paint, which means that it is a great deal smoother than semigloss paint on a microscopic level. This smoothness makes high-gloss paint more stain resistant and less susceptible to picking up dirt and grime. Glossier paint is also easier to clean, since dirt and stains are being wiped off the top of a smooth surface rather than scrubbed out of microscopic imperfections. The extreme smoothness of high-gloss paint gives the visual effect of a shiny plastic finish. Higher gloss results in greater resistance to wear and tear. High-gloss paint is less likely than semigloss paint to scratch or scuff. It is also more scrub-resistant, which means it can be washed more often and more vigorously without wearing through the paint film. This durability makes high-gloss paint a longer-lasting choice for areas such as baseboards and doors that are more likely to suffer abrasion and require washing more often than walls or ceilings. High-gloss paint has much greater leveling properties than semigloss paint, which means that high-gloss paint tends to smooth as it dries. Brush marks that are visible when the paint is wet are likely to vanish as the paint film forms. However, marks made when the paint is partially dry and tacky do not disappear. 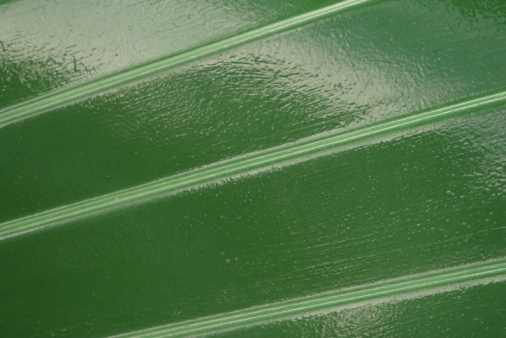 Since it is more difficult to achieve a smooth finish with wet high-gloss paint than paints with lower sheens, many first-time users end up with brushmarks by trying to smooth out partially dried paint. Semigloss paint has modest leveling properties more similar to lower sheens, and it is easier to achieve a smooth finish with wet semigloss paint. Charles Clay began writing professionally in 2011. He earned a Bachelor of Arts in English, as well as a Master of Library and Information Science from the University of Oklahoma.